New York City Mayor, Bill De Blasio, is promoting a new way of policing in order to make nicer police officers. The New York Times in January, 2018, reported that Mayor Bill de Blasio has a two-prong approach for neighborhood policing which includes, first, officers engaging in deeper outreach with residents and, second, an internal investigation of NYPD officers’ biases. Despite de Blasio promising for two years now that NYPD officers will undergo bias training, a single officer has yet to begin training. However, arrests have declined as well as complaints of police enforcement activity by citizens. NYPD precincts are also beginning to hold small neighborhood meetings that are aimed to help officers learn of locals’ crime concerns in their patrol areas. Although steps are being taken towards neighborhood policing, not all the neighborhood meetings are as active as others. These meetings are seen as crucial in order for NYPD officers to overcome biases and answer local residents’ concerns. At the heart of this new approach are two bills approved by New York City Council that together are known as the Right to Know Act. 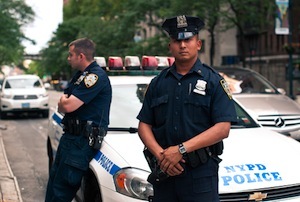 The bills require NYPD officers to provide business cards and a reason for stopping a person on the street, and compel NYPD officers to inform people of their right not to consent to searches. Objections to this bill were concerned with how many things that it left out, such as common street encounters, that include car stops or questioning by officers without suspicion of a crime. If you, or someone you know, has been the victim of a false arrest or been beaten up by cops and wishes to sue NYPD, contact the attorneys at PetersonDelleCave LLP.